International stock mutual funds should be part of your investment portfolio. They are useful for asset diversification. 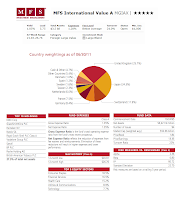 One of the best foreign large international stock funds is MFS International Value fund. This fund review is described below. I have included various information such as dividend yield, fund's CUSIP, expense ratio and more. The MFS International Value investment seeks capital appreciation. This MFS fund typically invests assets primarily in foreign equity securities, including emerging-market companies’ stocks. It may invest a relatively high percentage of the fund's assets in a single country or a small number of countries. The fund focuses on investing assets in the undervalue stocks of companies. Since October 2003, Barnaby Wiener has been the lead manager of this MFS fund. This top rated fund has a dividend yield of 1.05% per year. The annual expense ratio of this fund is 1.28%. This expense figure is a little bit lower than the average in the category which is 1.42%. This fund has 12b1 fee of 0.25% and front-end sales load fee of 5.75%. This fund has total net assets of $3.49 billion. Morningstar has rated 5 stars rating for this MGIAX fund. The best 1-year total return of this best international stock fund was recorded in 2003 with 32.03% within the 11 years positive years. The worst performance within 4 years of negative return occurred in 2008 with -31.91%. Based on load adjusted return, this fund has returned 7.98% over the past ten years, 2.51% over the past five years and 12.91% over the past year. It has 7.08% YTD return and 3.74% 5-year average return. MGIAX fund can be bought from a wide selection of 103 brokerages include JP Morgan, Merrill Lynch, LPL SAM Eligible, Fidelity Retail Funds Network, TD Ameritrade Inc, E Trade Financial, Morgan Stanley Advisors, Schwab, Raymond James, Royal Alliance, etc. For details this fund, you can check with your local brokerage agent or brokerage account. More article about best fund can be found in my website. 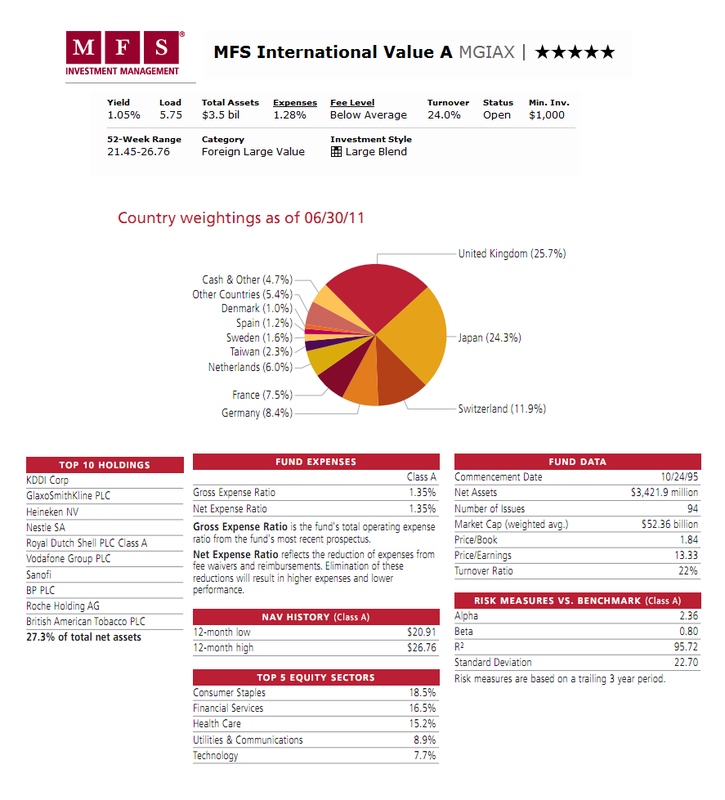 The top 5 country weightings of this MFS International Value Fund as of June 2011 are United Kingdom (25.7%), Japan (24.3%), Switzerland (11.9%), Germany (8.4%), France (7.5%) and Netherlands (6.0%). The top holdings of this fund represent 27.3% of the total net assets. They are KDDI Corp, GlaxoSmithKline PLC, Heineken NV, Nestle SA, Royal Dutch Shell PLC Class A, Vodafone Group PLC, Sanofi, BP PLC, Roche Holding AG and British American Tobacco PLC. Investing in this international equity mutual fund involves risks such as Stock Market Risk, Company Risk, Value Company Risk, Foreign Risk, Emerging Markets Risk, Currency Risk, Geography Concentration Risk, Derivatives Risk, Leveraging Risk, Investment Selection Risk, Counterparty and Third Party Risk, etc. More details about the risks in the fund’s prospectus.